Which is written by Larry Keltto and Jim Sheard, Ph.D. 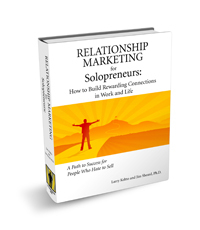 When you are a solopreneur, making connections and turning them into profitable relationships is an important part of building a network that will support you, work with you and refer work to you. It can also be daunting and frustrating when you don’t know how to reach out, who to reach out to and what to do when you find the courage to connect. Relationship Marketing deals with these problems and shows you how to create relationships with likeminded people to benefit your business. The materials are aimed at solopreneurs and small business owners but more specifically, people who want to expand their network, AND get more value out of their network. The book is pretty lengthy for a good reason – it’s not a quick fix. This isn’t about trying to collect as many people in your network as possible, this is about building sustainable relationships. A small, loyal community is more valuable than a large number of twitter followers who ignore your tweets. People looking for immediate results. Larry and Jim’s eBook is a lengthy one, and is staggered with lots of exercises and techniques to practice. If you’re looking to get to the final page and think you’ll have the answer then this isn’t for you. This is a resource to invest into that you can take your time with. It’s geared towards developing better habits and because it’s about building solid relationships, it isn’t going to happen overnight. Whilst lengthy, the eBook is very easy to read and the style, which is very personable and friendly, appeals to me. I also love the ethos of the book which is about building relationships on the value that you can offer rather than what you can gain. This is something that resonates with my values and if the idea of being a “me me me!” person when it comes to marketing turns you cold, you’re going to be in good company with Larry and Jim. The book itself has some great material in there, and it’s authentically written. In fact, I’ve noticed many techniques that Larry, the sly dog that he is, uses himself and it’s no accident that he is very well thought of in his community. The worksheets and the checklist are great to keep you on track, but I would say that one of the most valuable components of this, is the “Get Connected” community you become part of with the one-off purchase. The Get Connected forum has some fantastic minds in there, and there are members who are very committed to sharing what has worked with them. If the idea of a mini-mastermind group that is incredibly friendly, and small enough to still be personable appeals to you, you’ll love it in there. What is not so hot? Sometimes I’m lazy and I procrastinate, and the eBook plus the worksheets, plus the checklist and audio seemed like a lot to get through. There is an introduction in the book that tells you how to use it, but even that seemed like a lot of work. This meant I didn’t read it straight away as I thought it would be like climbing a mountain. But that’s because it’s not meant to be completed straight away. In fact, if you whizzed through this book, the great habits they’re trying to teach you just aren’t going to stick. How will I get the most out of it? I would say, read the book first – just glance through it. Then work through it properly with the worksheets and audio a little each day or each week. In fact, I’d give yourself some time to experiment with each of the techniques so you can really get used to doing them. If you don’t have time to do the worksheets straight away, then definitely hop over to the forum and check out some of the great “expert chats” and discussions going on there before coming back to the eBook. Yes I would. I think the access to Get connected is worth the $89 alone, but the book will really help people who feel like trying to connect with others “strategically” is a minefield. You can get your copy by visiting this page, and just to let you know this is an affiliate review, but you can see form my site that I don’t do a lot of reviews, and I wouldn’t recommend something to you if I didn’t honestly believe it was worth it. What’s more – is Larry’s just told me Harrisonamy readers get a 20% discount until Friday 29th October 2010 using this code: TSL01AH20 So if you want to take advantage if this, get your good self over there and see if it’s for you!